Barbecued Spareribs...I've been making this recipe for about 20 years now. It is one of those recipes I've cut out of a magazine...I don't remember which...probably Gourmet Traveller or Vogue Entertaining and Travel. My family love it. Actually one of my sons once told a chef at the hotel he was working, after a staff meal where the chef served spareribs "My Mum makes the best spareribs. I'll get the recipe for you". Combine ribs, 1/4 cup soy sauce, sliced ginger, green onions and star anise in large pot. Bring to boil and simmer 20 minutes. Cool to remove temperature in cooking liquid. Drain ribs. Whisk chicken stock, sugar, orange peel, minced ginger, garlic and 3 tablespoons soy sauce in bowl. 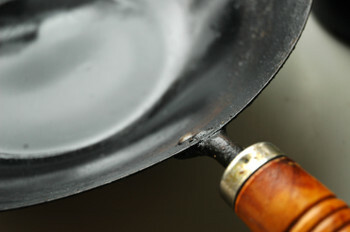 Heat oil in wok or large skillet. Add ribs and broth mixture. Stir fry until liquid is reduced to glaze - about 5 minutes. Serve 2 as a main course or 4 as an appetiser.